Search Engine Optimization has evolved to become the greatest force at the core of online presence. It’s all because of the immense and still-growing competency of the search engines like Google, Bing, and Yahoo. Thereof, every website owners are intended to devise prolific SEO strategies to bring-innatural traffic. But, it’s ensued only from a rock-solid SEO audit. There’s a ton of SEO ranking factors that need to be assessed during the audit. 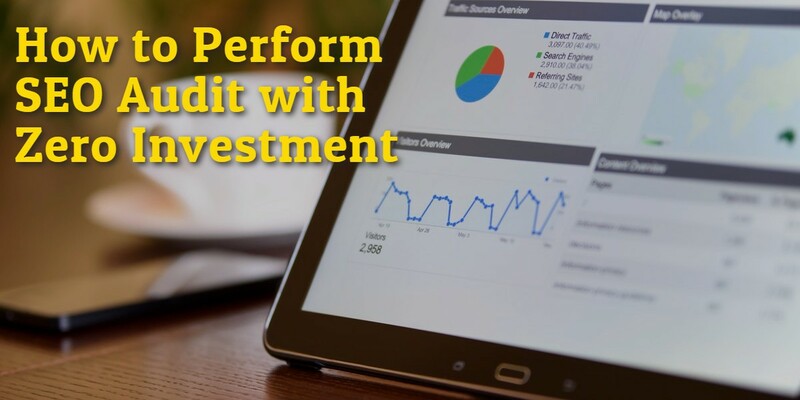 Let’s dive into some of the SEO audit methods that will demand zero investment. Each page has a unique title that shrewdly describes the content of the page. All the titles must be of an optimal length, i.e. 50 to 65 characters. It must consist relevant keywords, preferably at the beginning of the titles. Without a doubt, content is forever the king, when it comes to search engine ranking, as Google prefers Rich Media. Ensure that the contents are actionable and original, to go a long way with Google, as well as your visitors. Text -The text contents must be informative, grammatically error free, and void of spelling mistakes. Of late, the feature snippet is in vogue; strive to attain the 0 position. Images - Check is the image files are named descriptively; a senseless name won’t do any good.Also, make sure that the Metadata, like alt tag, title tag and captions are relevant and consists astute keywords. Check if the URLs are properly formatted. A good URL will be less than 255 characters long, constituting keywords, and appropriate hyphens (-), instead of underscores (_). It is better to follow flat architecture, which will probably elevate the ability of the users to navigate the website without losing a track. Many websites end up with multiple versions of its homepage with different URLs, such as (www.example.com, example.com, www.example.com/,example.com/). But, only one of these should be accessible in a browser, and others should be 301 redirected to the canonical version. Otherwise, all these paths will be crawled and Google will potentially identify them as separate pages. Google reports a 404 error when someone tries to visit a page that doesn’t exist. It’s usually resulted due to entities that have been removed from the website. Confront this by 301 redirecting the removed entities to similar ones. You can also try setting up a custom 404 custom page. It’s a better method, as a custom 404 page can retain the users, rather than encouraging them to leave your site. A good custom 404 error pages must include useful information that will help a visitor to stay on your site. The robots.txt file is very useful in restricting the Google bots to crawl certain sections of your website. However, improper use of robots.txt file can hurt the SEO rankings. 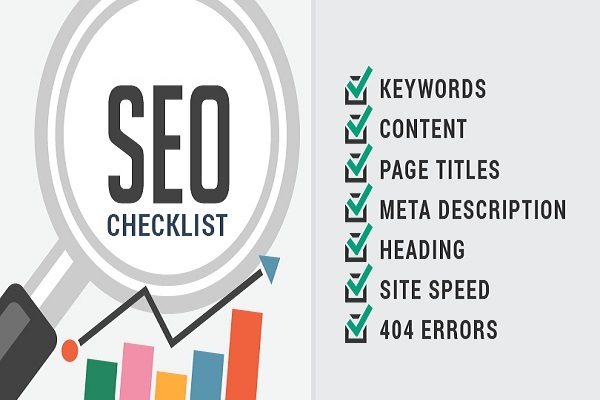 Hence, it must be checked manually in every SEO audit, to ensure the following points. Is it blocking all the contents, from being crawled? Does it refrain crawlers from going through the needed parts of your website? Is it putting forward, some vital info about the site that hacker might exploit? Google search operators primarily intend to fetch the right websites or a very specific piece of information on the web. Besides, they can also serve as a powerful option, in your fine-tune SEO audit endeavors. 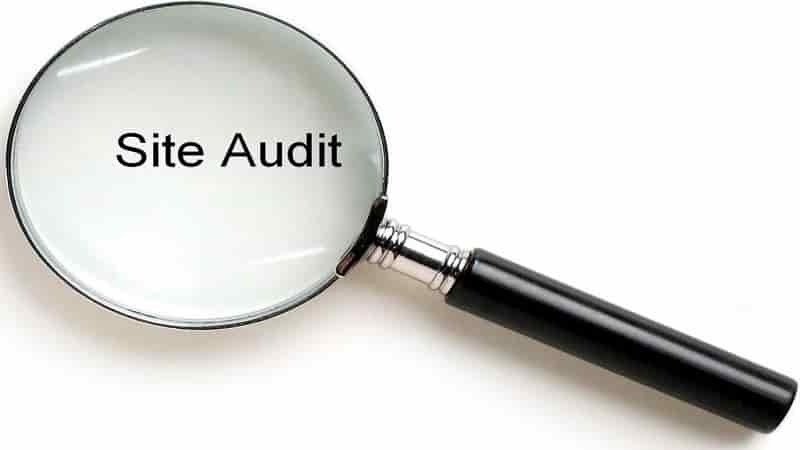 Well, after a comprehensive technical SEO audit process, we have to check the indexing of your website. That’s the process, where the search operators can get into action. The following are some of the search operators, ranging from the basic to the advanced ones. Using them, you can measure your SEO success and where you’re lagging. Site - It will pull results from a specific website. Cache - It helps in determining,the last time the page was crawled was. Related - The operator finds similar websites and sites with similar content. Info-It will help you find various info regarding the domain entered, such as cache, similar pages on the site and the pages with domain text. Allintext/Intext - This operator finds the sites, which either have all the specified terms or any of the specified term in it. Inposttitle/Allintitle - It’s same as the above, but searches only the titles of blog posts. inanchor/allinanchor - Pretty much the same, but searches the anchor texts. Filetype-You can specify the desired file type, for which you’re looking for. Exclude or Add words (+/-) -They're used to include or exclude certain terms in the desired search. Or - It can be used to fetch results for either of the search terms. Range (..) - It helps in finding results between specified ranges. The site operator shows how your site is index; and the number of pages indexed in the domain, as well. 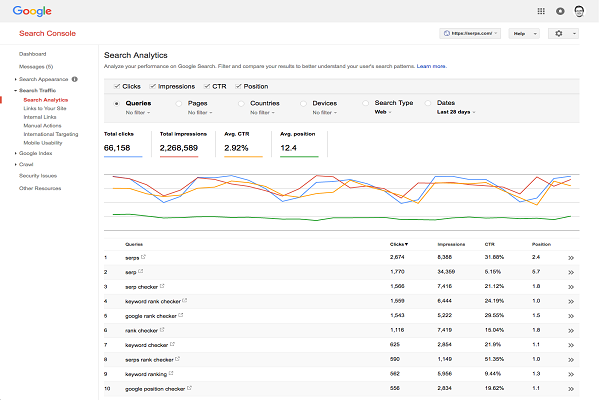 So, you can analyze how many of your pages have been indexed so far. The cache can tell you how often your site is crawled when checked periodically. The allinanchor can help you find backlinks, which are used in sites for your desired keyword. Therefore, you can arrive at various opportunities for your linking processes. Moreover, in order to perform an all-inclusive SEO audit through the search operators, one should deploy avaried combination of the operators. Here are some examples. site:domainname.com -inurl:https - This combination can help you identify your http: to https: transition, as per Google. site:domainname.com "search term" - This combination will help you identify duplicate contents within your site. site:domainname.com -inurl:www -inurl:dev- This combination will help you remove multiple subdomains, associated with your site. These are just a few examples. You can also come up with various customized search operator combinations, to pull out several data. Thus your SEO strategy can be elevated using operators. Google search Console is just what we previously, used to refer to the Google Webmaster tool. It’s a free tool, through which people can obtain data, regarding their websites’ search performance. Since it’s actually from Google, you can envision how Google sees your site, using it. Checking Sitemaps- Using this tool, you can examine your sitemaps. This greatly helps in the SEO audit, as it increases the number of pages crawled and indexed by the search engines. You even submit a new sitemap to Google, if the existing one doesn’t meet the expectations. Checking Crawl Rate -Throughthe Search Console, you can assumethe inaccessible pages; missing pages;the number of pages crawled a day; and server errors that are encountered by the bots, on your site. Taking necessary actions on these crawl errors helps in arriving at a healthier SEO strategy. Checking Links-The tool gathers a list of internal and external links on your site and shows where they come from. Next, it also shows the links from the lead sites that can hurt your site’s ranking. 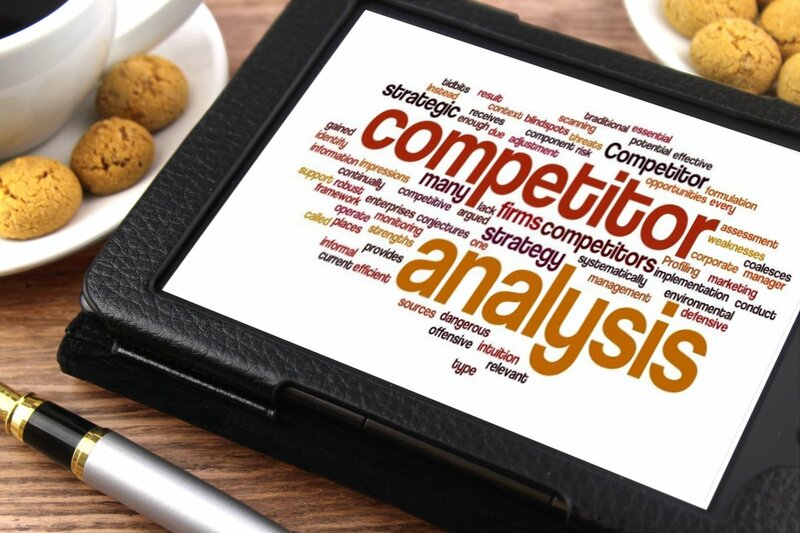 Find these issues using this tool and improve your ranking over the competitor. Checking keywords- In SEO, keyword plays an important role. Google Search Console helps to find the keywords that users majorly type-in to reach your site; and even the keywords that Google finds relevant for your site. In addition to this, it will also fetch you, the number of impressions, clicks, and CTR. Check this and start picking up the prolific keywords,from the users’ perspective. robot.txt launcher- The robot.txt feature in the tool will highlight the errors in it,and also warns you, when Google isn't crawling your site. It also helps to discover the pages that are blocked in by the robots.txt accidentally. Checking Mobile Web Crawling- Mobile web crawling feature helps in tuning and adapting to the mobile platform. It is same as the standard internet crawling, but you can use mobile web crawling to scrape specific customer information from social networks. A list of components that are channeling traffic to your site. The numbers of visits for those components. In addition to this, Google Analytics also gives an overview of the most visited pages; and the top landing pages, to infer the keywords that rank well in the SERP. But, how does it help in an SEO audit? Well, Google Analytics generates certain reports, related to your web traffic. And these reports can help you make some smart decisions, based on the SEO outcomes of your site. In essence, there are six kinds of reports, which we could use in an SEO audit. Channel Report -Helps you identify how and where your customer base finds your site. Landing Page Report -Derives data, on where you are performing the best in terms of engagement, conversion, and traffic. Frequency &Recency report - Puts forward data to decode the needed consistency for propelling contents every month. Site Search report- Helps you to count on the most need additions to your site. Behavior Flow report - It reveals the value your pages, and how customers respond to it. All these reports can play amajor role in accentuating your SEO progress and help you enact smart decisions. 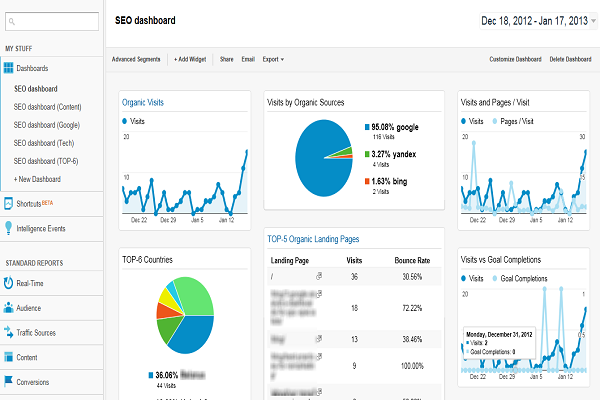 Thus, Google Analytics paves a prominent way for gathering and gauging natural traffic to your site. So, it’s all about cost-free SEO audit, and it wouldn’t be fulfilled without talking about the free tools.There are innumerable tools offer to audit your site, based on your SEO endeavors. While most of them are free, only the paid ones seem to be fruitful. Well, that’s deceptive. 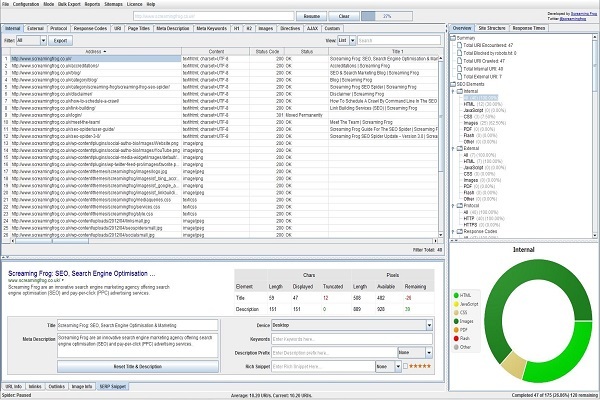 Screaming Frog is one of the best freemium tools. It’s primarily used for site audits that can quickly identify broken links; demonstrates a preview of what your SERP snippet might look like, and detect canonical issues. It’s basically a web crawler that scans your website and checks the technical and SEO parameters. 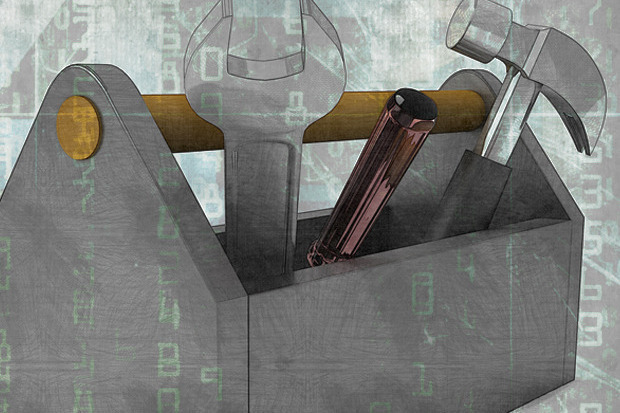 SiteAnalyzer help in correcting them effectively. It will analyze your broken links; check the quality of contents, in each page; examine duplicate contents, and solve indexation issues and exploration errors. It is completely a free tool that helps to discover all information about your website. It’s known for providing a competitive analysis; rank tracking; web monitoring; and keyword/content research. It’s one of the best, among the free SEO tools. It almost offers everything that the Google Analytics and the Search Console provides, in all SEO audit features. It deduces various rankings; top search queries; robots.txt files; site submissions; indexed pages; crawlability issues; etc. It generates easy-to-understand reports within a second and reveals what’s good and bad. 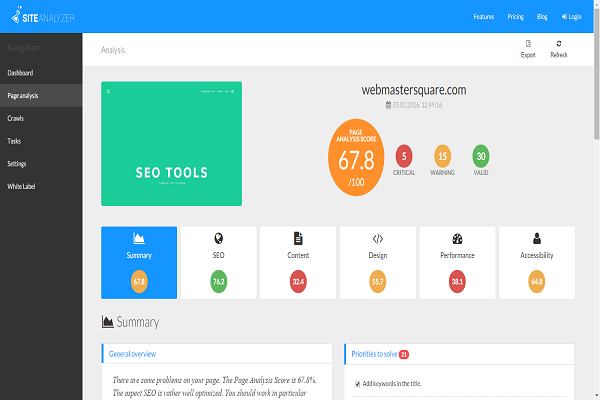 It’s even capable of analyzing your competitors’ sites and tells you what they’re doing better. Hence, you can seek for ideas to improve your site. 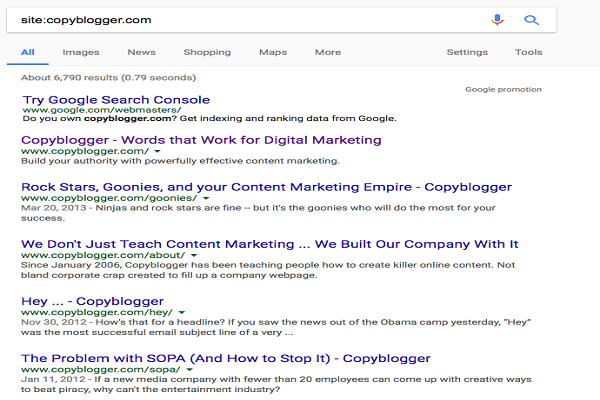 Additionally, it also provides a bunch of relevant articles, tips, and tricks to stay on the top of the SEO improvement landscape. Thus, an SEO audit doesn’t necessarily need to be cumbersome and cost-demanding all the time. With the enunciated methods, one can implement his/her own audit, at ease. Though it might need the hands of a pro, at times, implementing these factors periodically can help you track your site’s search engine endeavors. 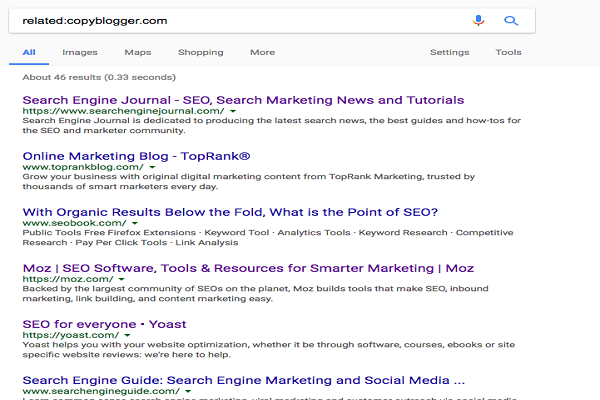 Really helpful I must confess, SEO Audit is very important for every Blog which will enable them to know the area they are lagging behind and also improve for a better result on search engine.